Spring is a busy time of year. Mother's Day, Graduations, Father's Day, and Weddings. 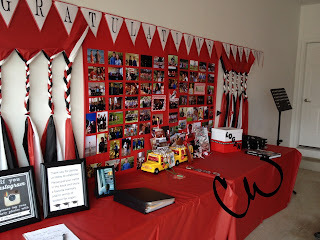 Here is out guide to make planning that graduation party planning alittle easier on you. Typically it is easier to hold these parties at home. Alot of times graduation parties are more like open houses, since there a couple hundred of them going on around the same time. The backyard is a great place to house this, add a tent and some tables are you are ready to go. Since graduations are typically head on a Saturday or Sunday afternoon, think about having it on the alternate day (so Saturday if on the graduation is on Sunday). It is perfectly acceptable to hold it the day before, or even the weekend after. I would caution against having it right after the ceremony. That is a time for family to celebrate with a special dinner. Try to gauge when others are holding their parties and find a day that is not packed with other events. Graduation parties are all about the mingling so I always suggest finger foods, or foods that can be eaten by hand. You don't need to worry about serving a whole meal, it is likely that your guests will probably have another party to go to. Make it easier on yourself and order the veggie and cheese trays. Think about wraps, and sliders. Use paper products to make clean up easier. The theme of this party is easy. Your graduate! Decorate in the colors of their school. Complete the decorations with pictures and symbols (certificates, medals) of their achievements. Below are the decorations my sister (and nephew) designed at made for his party! Surprise your grad with a food truck to feed their friends. Although this is not cheap (typically this will start at $600 - $1500 depending on the menu), it will score you big points! Create a photo booth for the party. It's easy. Hang up a plastic tablecloth (you can find these at the party supply store, or even the dollar store), and then put out a selection of silly hats, sunglasses are feather boas. They will have a blast taking pictures and sharing them.